Cambodian prime minister Hun Sen has declared a day of national mourning following a stampede in the capital, Phnom Penh. At least 378 people are known to have died in the incident, with twice as many injured. The crush happened on a bridge over the river Bassac as upward of two million visitors to the city enjoyed the annual Water Festival. Revellers had been enjoying a concert on Diamond Island, which followed a boat race on the Tonle Sap River. As they tried to leave the bridge became overcrowded and a stampede began. 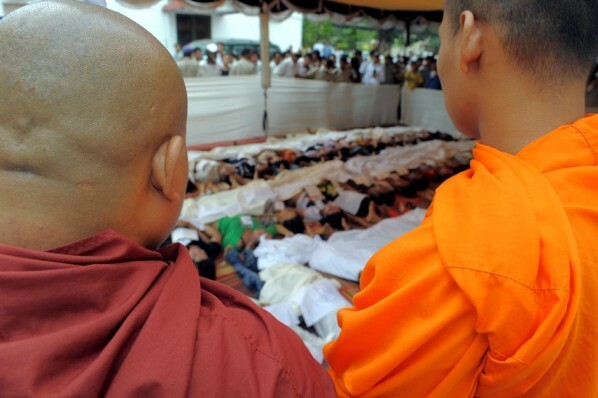 Ordering an investigation into the cause of the disaster, Hun Sen described the events as the “biggest tragedy” to hit Cambodia since the mass killings carried out by the Khmer Rouge regime in the 1970s. All government ministries will fly the national flag at half-mast today. Many of the deaths resulted from crush injuries and suffocation. Authorities are searching the river for the bodies of those who may have drowned. No foreign nationals are believed to be among the dead. Calmette Hospital, Phnom Penh’s main medical facility, was filled with dead bodies as well as the injured, some of whom had to be treated in hallways. The stampede is the world’s worst since August 2005, when more than 1,000 Shia pilgrims were crushed to death or drowned in the Tigris river in Baghdad, Iraq, after rumours of a suicide bomb attack sparked a panic.